ReconPro™ now available on the iPhone, and iPod Touch! We have been approved ReconPro™ is now available on the iPhone, and iPod Touch! 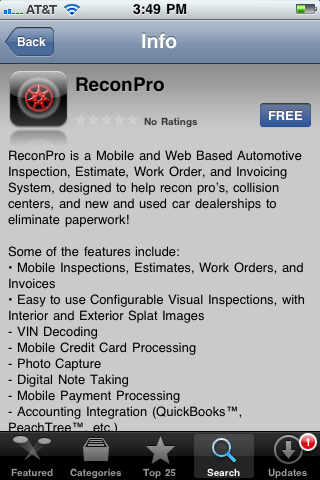 You can download the application via this link http://bit.ly/reconproiphone, or by searching for ReconPro in the App Store! Once you download the application would will need to register your device, in order to do so you will need to click here contact us. In Case you aren’t 100% familiar with ReconPro™ here is a short description. Estimate, Work Order, and Invoicing system, designed to help recon pro’s, collision centers, and new and used car dealerships to eliminate paperwork!